This months challenge at "let's get Shabby" is to do a project with some type of love letter, note ect. I chose a note that my Grandaughter Whitney wrote to me when she was a little girl. I used Graphic 45 papers, took an envelope & distressed with inks & put a rub on on it, the note I scanned then printed on velum. 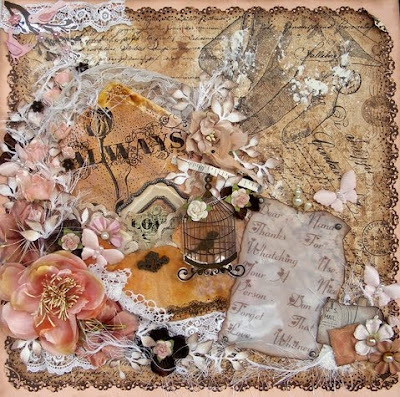 more details & some Gorgeous inspiration at the Let's get shabby blog. We have another great sponsor & prize this month, so come join in!!! This is such a beautiful layout. Love the random use of lace and krinoline(?). Love the bird cage as well! So beautiful and so much to look at!!! Gorgeous Toni!! I can't stop looking at it! Beautiful !! Love your work and the beautiful details !! beautiful work as always, love the details and colors.